Drug testing refers to the process of detecting "drugs" in human or animal specimens. Drug testing may be performed in the contexts of sports, workplace safety, therapeutic drug monitoring, forensics , toxicology, and drug abuse prevention. 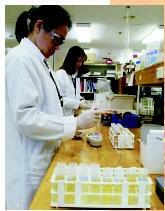 Human drug testing is most commonly performed by analysis of urine or hair samples. Blood may provide a more appropriate source in certain circumstances, for example, monitoring doses of pharmaceuticals. In some cases, testing can be done on excised (removed) tissue samples. Drug testing is complex because most foreign chemicals taken into the body and entering the blood system, either by injection or ingestion through the digestive system, undergo some form of metabolism or chemical transformation. This generally occurs in the liver. One or more metabolites (transformed chemicals) are produced that may be removed via filtration through the kidneys and ultimately excreted . Although the drug in its native chemical form may be rapidly broken down, its metabolites may persist for extended periods of time. Some metabolites accumulate in tissue. For example, if a metabolite or drug transported in the blood manages to penetrate the barrier surrounding the brain, it tends to accumulate, often resulting in some pharmacologic (desired) or toxic (undesired) response. Technical approaches used in drug testing have undergone significant advancement. When a drug-testing laboratory performs such analyses, the specimen is fractionated, or divided, into its components. The compound of interest and its metabolites are characterized based on specific physical and/or chemical properties, which allow subsequent identification. For example, the charge and molecular weight of a compound often provides a specific "signature" of that chemical. There are numerous separation techniques, with the simplest being liquid chromatographic (LC) procedures and the most complex being a combination of two analytical methodologies such as gas chromatography (GC) with mass spectrometry (MS). Liquid chromatography can also be combined with mass spectrometry. For optimal sensitivity, GC-MS and LC-MS may be done as complementary procedures, providing the most convincing identification of a particular chemical. The sensitivity of MS is significantly greater than that of LC or GC procedures; consequently MS can identify trace amounts of material. Analytical chemists develop and test these procedures. The sophistication of these methods makes it extremely difficult to intentionally fool the test. Home drug testing kits for a number of drugs of abuse are now available by online purchase but are not as sensitive as laboratory methods. They generally work by producing a color reaction demonstrating the presence of a specific drug of interest. The application of laboratory and home testing procedures provides safer workplaces and ultimately leads to a safer environment. American Toxicology Institute, Inc. <http://www.atilab.com> . Bocxlaer, Jan F. Van, Karine M. Clauwaert, Willy E. Lambert, Dieter L. Deforce, Elfriede G. Van den Eeckhout, Andre P. De Leenheer. "Liquid Chromatography–Mass Spectrometry in Forensic Toxicology." Mass Spectrometry Reviews 19, no. 4 (2000): 165–214. Cook, J. D., et al. "The Characterization of Human Urine for Specimen Validity Determination in Workplace Drug Testing: A Review." Journal of Analytical Toxicology 24 (2000): 579–588. Kerns, Dennis L., and William I. Stopperan. "Keys to a Successful Program." Occupational Health and Safety 69, no. 10 (2000): 230–234. A technician performing a density test from urine samples at the Australian Sports Drug Testing Laboratory in Sydney.